In sixth grade language arts, students analyze a variety of literary themes and genres. The class will read classic novels like The Outsiders, The Giver and So Far From The Bamboo Grove and frame them in their social and historical contexts. At the end of the year, students will read A Soldier’s Secret by Marissa Moss. This story is about a young girl fighting in The Civil War and is chosen to further enhance the Civil War unit in students’ social studies class. Vocabulary is taught from the texts being studied and grammar instruction is embedded in writing lessons. Students develop their critical writing skills and cultivate their author voice through closely examining word choice, mechanics and sentence structure. The topics included in the sixth grade math curriculum are decimals, data analysis and displays, fractions, ratios, percents, geometry, and probability. Students work on performing all four operations on fractions and decimals and converting between fractions, decimals, and percents. They also apply percents to real-world situations including taxes and discounts. For data analysis, students find averages and learn multiple ways to display data. Sixth graders write and compare ratios and use proportions to analyze maps and create scale drawings. Our geometry unit includes exploring attributes of angles, as well as two-dimensional shapes and three-dimensional solids. In probability, students apply the counting principle and determine the number of possible combinations or permutations for given situations. In the fall, sixth grade science students participate in a Metric Olympics to review measurement skills and they apply their knowledge of the metric system to converting between metric units. Students use water to examine the four states of matter and their phase changes. Students also conduct lab experiments to observe physical and chemical changes while determining the properties of matter. 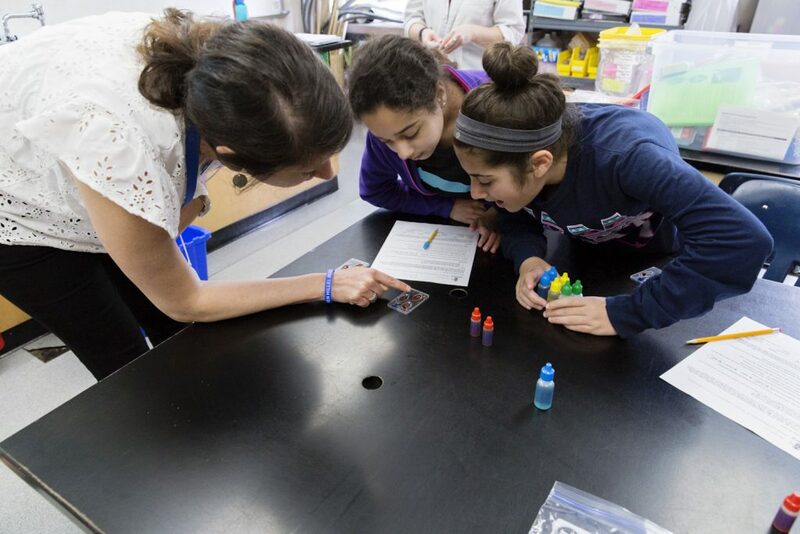 Later in the trimester, students dive into the field of ecology, including learning about the three types of symbiotic relationships, food chains, and biomes. In the spring, students learn how to properly use a compound light microscope. After observing various specimen under a microscope, students identify the structure and function of cell organelles. Students later create a 3D-printed model of a plant or animal cell. This project leads students to an introduction of coding and programming Lego Mindstorms EV3 robots. Students work together to plan and program their robots to carry out various tasks and challenges, such as moving objects to given targets and navigating through an obstacle course. In sixth grade social studies, students study the events following The American Revolution through The Civil War. A variety of assessments such as creative writing assignments, analysis of primary sources, and project based learning are used to determine student comprehension and progress. Students also read novels that are connected to the social studies units to deepen their appreciation for the historical time period. Sixth grade students begin by analyzing the failures of the Articles of Confederation and follow the progression to the framework of the United States Constitution. Students then learn about the events that led to Westward Expansion and the development of the United States as a country. The major causes of The Civil War and the events that led to the Union’s victory are studied in the spring. Students in sixth grade Hebrew focus on being able to speak, write, and read using the present and past tense. Reading fluency is developed through varied texts such as short stories, poetry, and print media. Students read a full-length novel in class to expand vocabulary and experience Israeli literature. Students also analyze and describe major events, themes, and concepts in Hebrew. Students study biblical events from an historical context and follow the progress from biblical to ancient Israel. They explore many different themes such as family, leadership and interpersonal relationships. Students learn how to navigate through the Tanach and find specific verses in English and Hebrew. In sixth grade Jewish studies, students deepen their understanding of Jewish holidays and their historical, natural/agricultural, and faith-based foundation. They learn how our customs and traditions enrich and strengthen them as individuals within our Jewish community. Prayers and blessings related to the holidays are recited and Hebrew stories connected to the Jewish holidays are studied. Students develop a meaningful relationship with Israel through personal connections with language, people, places, and events. As an ancient land and modern state, we teach our students that Israel is a home for diverse and vibrant expressions of Judaism. Through our cutting-edge Hebrew language curriculum, experiential programs, and Israeli young emissaries (Shinshinim), our students engage with Israel at all grade levels and feel a deep connection to their homeland. In sixth grade, students share a partnership with a sister school in Haifa, Israel. Students in both schools communicate throughout the year and do joint projects to learn more about each other’s cultures and build friendships. The goal of our music program is for students to become skillful and enthusiastic music makers, encouraging music literacy, participation and performance. Through classical and contemporary music, students learn to sing in-tune with expression and confidence while gaining confidence on stage. They read music and play several instruments including ukuleles and drums. Students also explore music composition using technology such as Garage Band. Music is integrated across the curriculum as students sing and perform to enhance understanding of subjects from social studies to Judaics. Sixth grade students continue to build on character work and presentation skills from the previous year by holding mock debates. Students deepen their ensemble capacity as they work together to perform the spring musical performance. Students also strengthen their character work by analyzing text in order to discover character motivation and learn how to bring that out in their performances. Students demonstrate the beginning mastery of all their skills during rehearsals and performances of the spring musical. Students in physical education classes are encouraged to participate in sports education, teamwork, physical fitness activities and sports strategy. In addition to gross and fine motor coordination, stretching and agility, middle school students are taught age appropriate sports skills and team communication through drills as well as game-like scenarios. Units include soccer, flag football, team strategy games, floor hockey, ultimate frisbee, individual problem solving games and basketball. Social team building and sportsmanship skills are woven into game like scenarios to teach students not only the skills to play multiple sports but the interpersonal skills to function in a fast paced team environment.